Distributed:Health 2016 was the first ever healthcare-focused blockchain conference in the world. It was held in the healthcare capital of the United States – Nashville, TN. It was a terrific event and helped birth ideas, collaborations, and companies. In 2017, Distributed:Health was back in Nashville with conversations about much more mature efforts in the space. By the end of the 2017 conference, a common refrain was: last year people asked what blockchain was, but this year people are talking about what they are doing. I was fortunate to be part of one of those main stage conversations centered around the use of blockchain for clinical research organizations (CROs) and data sharing. I was joined by the luminaries listed on the title slide below, which represented a spectrum ranging from evangelists to skeptics. Over the past few years my exploration of blockchain for healthcare has been an interesting journey. As has everyone I would imagine, I have received a lot of questions about blockchain – particularly in the last 12 months. They range from generalist inquiries to consulting requests. Often it is about how I became involved. To that end, I have added a brief timeline of my roles and work in in this arena, which can be found here. Recently I was invited to participate on an article by some of the fine folks at iMedicalApps. While I had done some things with them in the past dating back to a guest post in 2011, including providing early coverage of Medicine 2.0 @ Stanford, I had never collaborated with them on a conventional journal article. In this case, the effort was led by fellow pharmacist Timothy Aungst, PharmD as part of his efforts to bring a stronger eye of assessment to the unsettled world of medical apps. 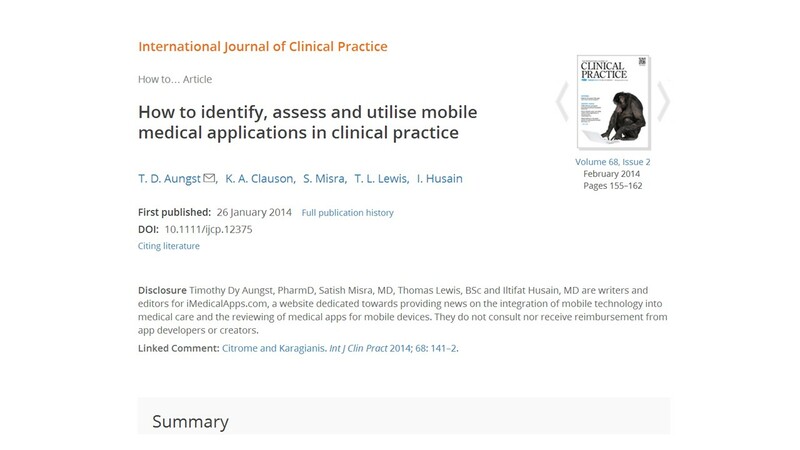 This particular effort yielded the article, “How to identify, assess and utilise mobile medical applications in clinical practice”, which was published in the International Journal of Clinical Practice. The aim of the article is basically outlined in the title. This was to be a practical paper for a clinician audience highlighting key aspects of the steps for: 1) identifying, 2) assessing, and 3) using medical apps. I believe a good paper came out of this collaboration and it certainly sparked the most creatively titled editorial comment (Battle for the Planet of the Apps). Source: Aungst TD, Clauson KA, Misra S, Lewis TL, Husain I. How to identify, assess and utilise mobile medical applications in clinical practice. Int J Clin Pract. 2014;68(2):155-62. doi: 10.1111/ijcp.12375. The White House Office of Science Technology and Policy and Stanford Medicine X co-created a special event to “…focus on engaging participants as partners in research, a core principle of the President’s Precision Medicine Initiative.” The event was hosted at the White House and captured the spirit of Everyone Included as it was comprised of a diverse group of patients, researchers, clinicians, designers, and technologists, as well as experts in law, policy, and citizen science. As can be imagined, it was quite a humbling experience to be invited to go to the White House and take part in this august gathering. Reflecting the co-creation of the event, it was opened in concert by OSTP’s @ClaudiaWilliams (above) and Med X’s @LarryChu (below) followed by addresses by White House OSTP leadership including Chief Data Scientist DJ Patil, Precision Medicine Initiative Project Manager Stephanie Devaney, and later US Chief Technology Officer Megan Smith. Johns Hopkins – Sibley Innovation Hub’s @NickDawson (below) set the tone by brandishing post it notes. He encouraged everyone to use these sticky notes as the tools of a designer and the Stanford Medicine X’s Brainstorming Tips throughout the Workshop to develop questions and aims tied to partnering with participants for research with an eye towards the Precision Medicine Initiative (PMI). My impression was that the use of the broader term “participants” rather than the narrower category of “patients” was a PMI-influenced reflection of the roles to be played in research by people who self-identify as “in good health” or “well” or those who are focused on maintaining health rather than managing an acute or chronic health challenge. Claudia Williams also announced that during the event the Robert’s Rules of Order Chatham House Rule would be in effect. The Infusion Nurses Society asked me to speak about the use of social media and patient education at their INS Annual Meeting (#INS2016). This year INS Annual was held in Ft. Lauderdale, FL. I have not had many opportunities to return to the Sunshine State since I relocated to Nashville two years ago, so I was looking forward to this conference on several fronts. The presentation ended up being a little more broadly based on social media in health care to account for the pretty wide mix of social media users in the audience. The full deck is embedded below; presentation subtopics were: social media platforms & usage, educating our patients about social media identities, health care education and behavior change for patients, social media research, and #socialgood. I was able to attend some of the other sessions and speak with attendees and presenters. Infusion nursing is not an area I have expertise in, so essentially everything I saw and heard was a good learning experience. I also learned a modest, but thoughtful thank you gift with a handwritten note for speakers still means a lot. Nicely done INS! From the one-of-these-things-is-not-like-the-other research file, this gem of a study was heavily influenced by the psych titans who I was fortunate enough to collaborate with. I learned quite a bit, including the term cosmetic psychopharmacology. I rationalize this occasional stream-adrift type of research with the findings of a 2015 MIT Sloan Management Review piece which concluded that professionals with diverse (Twitter) networks who get out of their comfort zones and gain exposure to different processes were more likely to surface innovative ideas. That’s my story. I am sticking to it. Cognitive and performance enhancing medication use to improve performance in poker. Journal of Gambling Studies. 2015 Oct 8. Caballero J, Ownby RL, Rey JA, Clauson KA. Use of neuroenhancers has been studied in groups ranging from students to surgeons; however, use of cognitive and performance enhancing medications (CPEMs) to improve performance in poker has remained largely overlooked. To assess the use of CPEMs to improve poker performance, a survey of poker players was conducted. Participants were recruited via Internet poker forums; 198 completed the online survey. Approximately 28 % of respondents used prescription CPEMs, with the most commonly used including: amphetamine/dextroamphetamine (62 %), benzodiazepines (20 %), and methylphenidate (20 %). CPEMs were used in poker to focus (73 %), calm nerves (11 %), and stay awake (11 %). Caffeine (71 %), as well as conventionally counter-intuitive substances like marijuana (35 %) and alcohol (30 %) were also reported to enhance poker performance. Non-users of CPEMs were dissuaded from use due to not knowing where to get them (29 %), apprehension about trying them (26 %), and legal or ethical concerns (16 %). Respondents most frequently acquired CPEMs via friends/fellow poker players (52 %), or prescription from physician (38 %). Additionally, greater use of CPEMs was associated with living outside the United States (p = 0.042), prior use of prescription medications for improving non-poker related performance (p < 0.001), and amateur and semi-professional player status (p = 0.035). Unmonitored use of pharmacologically active agents and their methods of acquisition highlight safety concerns in this cohort of poker players, especially among non-professional players. The current state of guidance from national organizations on CPEM use in healthy individuals could impact prescribing patterns. A gentle street poet named Earl Simmons once penned the words, “X Gonna Give It To Ya”. I can’t remember the next line of the stanza, but I think it may have been, “If You Let it”. He may very well have been talking about Stanford Medicine X, because you kind of have to be open to what it has to offer. But if you are, it will deliver quite an experience. 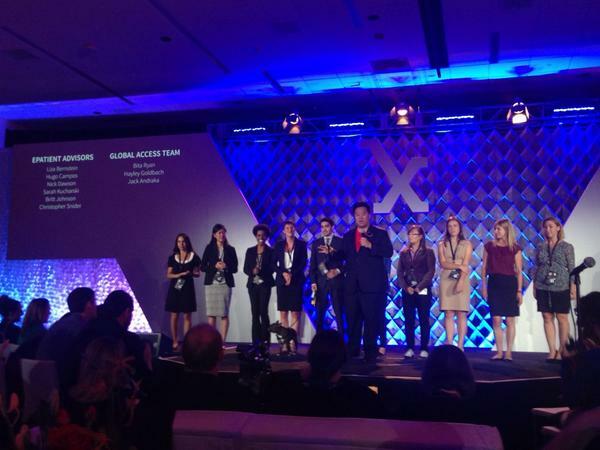 As usual, #MedX started well before the conference proper with the pre-conference which generated an outpouring of tweets and other activities leading up to its kickoff this year and throughout the conference. If there is any doubt, the fine folks at Symplur have put that question to bed. From the pre-conference, there was a high-utility tweetstream for anyone interested in clinical trial design, particularly those seeking ways to integrate the patient. From afar, it appeared the workshop was very effective in introducing epatients to the complexities and headaches of clinical trial design and execution AND in introducing researchers to what epatients really care and think about with clinical trials.